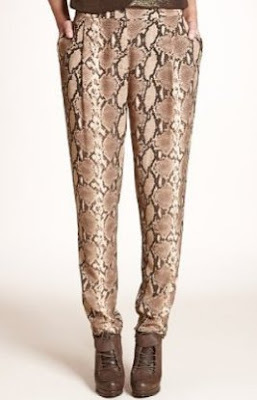 Snake prints are everywhere in fashion this season, and we love Marks & Spencer's take on the trend. Zara, Karen Millen and a host of other high-street brands are in on the act too. The pieces are gorgeous, and give you the designer look for high-street prices. Our favourite pick here at Twinkle Magazine HQ are these Snakeskin Print Straight Leg Pleated Trousers (£25) from Marks & Spencer. They definitely make a statement, so make sure you pair them with a plain top or blouse. There are plenty of options out there for you if you like the snakeskin print. If you worry about going over-the-top, try just a clutch-bag or scarf instead.